There’s a reason that one team has been the dominant team in the National Football League for the last 15 to almost 20 years. One team has stood above all the rest and that team is the New England Patriots, which are run by cold-blooded Bill Belichick. Yes, I’m talking about cold-blooded Bill Belichick who gets rid of players that just helped him win a Super Bowl because he gets rid of a guy a year early, rather than keeping a player a year or two, too long. It’s cold-blooded to think that way, but as I said — there’s one team that has dominated the NFL for the last 15 years. By the way, they happen to be playing on Sunday in the AFC Championship game for the eight year in a row. The Eagles have some serious decisions to make on their offensive line and that starts with left tackle, Jason Peters. Peters has been one of the greatest offensive tackles in the history of the NFL and he’s probably going to be a first ballot Hall of Famer. He showed us all at the end of the season that he’s still capable of playing well, when he’s healthy. Unfortunately, he also showed us that he can’t stay healthy any more. Peters injured his quad (thigh) early in the season and it forced him to take himself out of numerous games. It got to the point where during the games that he played, I was wondering, “When is Peters going to go down today?” He also suffered a torn bicep and the big guy was bothered by a back injury throughout the season. 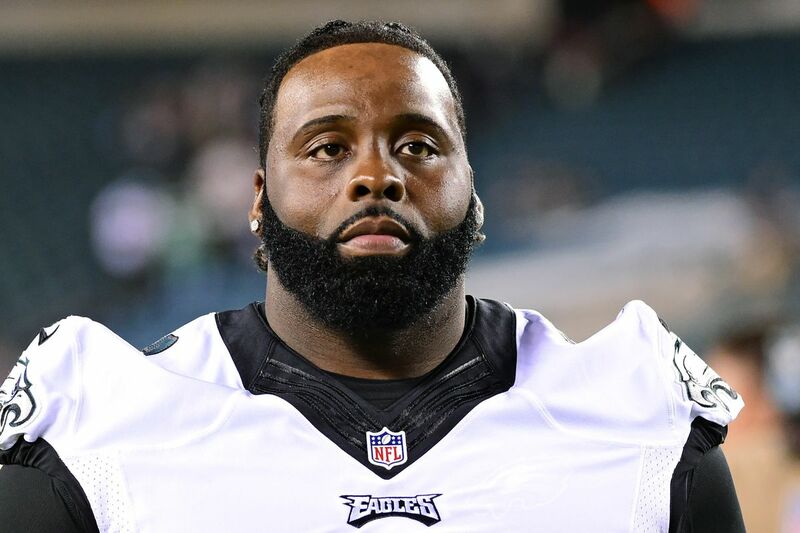 In my opinion, it’s time for the Eagles to say “good-bye” to Jason Peters. Peters is such an impactful leader on the team that keeping him around would leave the door open for his teammates to be looking to him for production that he can no longer provide. It’s never easy to part with guys who were great players, but it may just be time for Peters. Another reason to say good-bye to Peters is the salary cap. In the near future, the Eagles will need additional funds to start paying Carson Wentz at least $25 million a year, which is the going rate for a franchise quarterback. They can’t afford to spend $10 million dollars on a player who may not play from week to week. They’ll need to start making cuts in other areas and now is a good time to start. If they release Peters they will save $8 million dollars against the cap for his $10 million dollar a year salary. Backup left tackle Halapoulavaati Vaitai has showed us that he can play the left tackle tackle position and do a pretty good job, if he knows that he’s the starter and he’s getting all of the practice reps. If he’s not getting the practice reps, when you put them in game it takes him a while to start playing quality football. Vaitai needs to be more consistent with proper pass blocking techniques. He has to guard against losing his focus at times and he’s got get more disciplined from play-to-play. Vaitai needs to realize the urgency that now is his time to do the job. It’s not only time for Big V to step up, but the time is coming for the Australian prodigy, Jordan Mailota. The former rugby player is an amazing athlete and tremendous prospect. His upside is frightening, but I don’t know if he’s going to be ready in the next year. Mailota has got amazing potential. I think he’s be ready to play in 2020 if he works at it. He is an athletic freak. You’re talking about a man who is 6’8″, who weighs 345 pounds with amazing arm length and athletic ability. The Eagles offensive line coach, Jeff Stoutland, is very high on Jordan and he has been stunned by the development he’s shown in his first training camp and preseason games. He has the athleticism of Peters, only he’s much bigger, stronger and his arms are much longer. Arm length is very important in offensive linemen because long arms allow you to get your hands on your opponent before he can get his hands on you. It’s a huge advantage and Mailota has this. He has the potential to be the dominant left tackle in the NFL, they’ve got to develop him this off season. Right now, the left tackle job would be Big V’s, if they release Peters. The Birds will be hoping to get back Pro Bowl right guard Brandon Brooks who tore his Achilles tendon in the playoff game loss to the New Orleans Saints, as soon as possible. Some say he’s going to be back eight months, others say nine months, and other say ten months. Who knows? Whatever the time it’s going to take him to get back on the field, chances are it’s going to take him much longer to return to the level of outstanding play that we were getting from him prior to the injury. You are probably going to see veteran Stefen Wisniewski step in there at the starting right guard position until Brandon returns. Wiz is dependable and smart, but he isn’t the road grader that Brooks is. Brandon is one of the two or three best run blocking guards in the game today. If you noticed, the Eagles’ ability to run up the middle disappeared against the Saints once Brooks left the game. He’s about as thick as an Oak tree trunk. Brandon can get movement at the point of attack. Hopefully he gets back sooner than later. You’ll have Isaac Seumalo at the left guard position. He played well this season especially as a run blocker, but he still needs to improve his pass blocking. Seumalo needs to learn to not be overly aggressive as a pass blocker. He’s got to be patient. Of course, you’ve got Jason Kelce at the center position. He’s a great player and key leader on the football team. Kelce was voted to the first team All-Pro team this year. It clearly means a lot of people in and around the National Football League consider him to be the best center. He’s the leader of that offensive line. He’s very smart and athletic. Kelce is the best center in the league when it comes to getting downfield in front of screens and draws. He plays with passion, smarts and all his heart, which I think is a motivating factor for the rest of the guys on that line. The Eagles aren’t the same football team without Jason Kelce and he will be back next year but going forward he might not play as long as a lot of people would hope. Kelce let it be known that after each season he puts everything on the table including retirement. There was a report claiming that he was going to retire this year, but made it clear he is playing in 2019. Lane Johnson will be the right tackle and he’s as good as any in the NFL. The former Oklahoma Sooner was upset late in the season when he found that he didn’t get voted to the Pro Bowl this year. He took his anger out on the guys he was blocking late in the season. He did a great job of dominating outstanding pass rushers like JJ Watt and Khalil Mack down the stretch of the season and the playoffs. Johnson did such a great job on Watt and Mack, that it was hard to tell whether they were out there playing in the game or not. The big fella is in his prime and he’s one of the best offensive tackles in the game. While the Birds will have to make some big decisions on some really good players, it does seem that they have the guys who are ready to step up to the job. The Eagles need to think ahead and figure out which guys they want to invest in for the coming season and who they think is ready for the big stage. Wrong call, wrong time. Trying to live up to a standard created by a team that cheats everyday of the week and twice on Sundays with a lot of players that couldn’t start anywhere else isn’t going to help anyone. Vaitai, right now, looks like Winston Justice 2.0…No thankyou. Unless the Eagles can grab a stud OT in the draft or a costly All Pro OT to replace Peters it doesn’t make sense for next year. Maybe if they finally decided to slide Lane Johnson over it might make sense, but the reality is that Peters will most likely be more durable in year two after surgery, so the Eagles have a year or maybe two to find another stud OT. Paulman back with his “get rid of everybody so we can build the ‘Dream Team’ again” routine. It’s not time to blow the team up. Brothers, Paulman is spot on. We need to get much younger (and cheaper)! We must have more playmakers along the defensive line and how about a playmaking linebacker! People forget how great it is to have a LB who can make big plays. We need youth and SPEED on both sides of the ball. After having a heart to heart with my uncle Lebron James and my grandfather Michael Jordan I have decided to come clean. I lied about all my fake kids and am sorry my mental illness turned many of the posters off to this site. I am now taking medicine and living in reality and hope to be a positive contributor. I rreally enjoyed myself at my sons wedding reception in Manchester, New Hampshire October 20th…. I enjoyed dancing with my daughter in law Mykyla….who by the way is expecting my 5th Grand child……sorry to disappoint your disbelief….but as usual, that’s your problem. Hey GMCliff, Good to see that You’re feeling and doing well.. This Draft is Very Deep across the D/Line where I think the Eagles Need Youth & Depth at Both DE & DT Positions.. In Fact this Draft is much better on the Defensive Side of the Ball and pretty thin at OT, WR & RB so I’m focusing the early Eagles Picks from the Strength of the Draft with the hopeds that they will get Younger, and more Athletic on every level of their Defense .. I like both LB Tre Watson and Safety Juan Thornhill which could really sure up the middle of the Eagles Defense for years to come.. So your Trading/Cutting your Best LB (Bradham) and WR’s (Jeffrey and Agholor) ? Whose Catching the Ball form Wentz outside of EErtz ? I love CJ Mosely, and Kareem Hunt as well Paul……. Any chance we can get our hands on AJ Green? ?, and also sign DeSean?? That’s a fake GMCliff Paul…..doesnt surprise me….but it funny, and flattering..
Youre so cool! I dont suppose Ive learn something like this before. So nice to search out any individual with some unique ideas on this subject. realy thanks for starting this up. this web site is something that is wanted on the internet, somebody with a bit originality. useful job for bringing one thing new to the web! Good post. I learn one thing tougher on different blogs everyday. It is going to at all times be stimulating to read content material from different writers and follow somewhat one thing from their store. I’d prefer to make use of some with the content on my blog whether or not you don’t mind. Natually I’ll provide you with a hyperlink on your internet blog. Thanks for sharing. Wonderful website. Plenty of helpful info here. I am sending it to a few friends ans also sharing in delicious. And of course, thank you for your effort! I?¦m no longer positive where you’re getting your information, but great topic. I needs to spend some time learning more or working out more. Thanks for great information I used to be in search of this information for my mission. dyqnbo,Hi there, just wanted to say, I liked this article. It was helpful. Keep on posting! Thank you for the good writeup. It in truth was a leisure account it. Glance complicated to more introduced agreeable from you! By the way, how can we keep in touch? A lot of thanks for all your valuable effort on this web page. My aunt really loves getting into research and it’s easy to understand why. Most people know all concerning the lively means you deliver simple techniques through the website and therefore boost contribution from visitors on this situation so our own daughter is truly studying so much. Have fun with the rest of the new year. You have been doing a tremendous job. Thank you for another fantastic post. Where else may anybody get that kind of info in such a perfect method of writing? I have a presentation next week, and I am on the look for such info.